Ghost data replay in a racing game. In this article, we'll work through an example of how to share ghost race data that would allow a game to display another player's previous attempt at a track/level within a simple racing game. 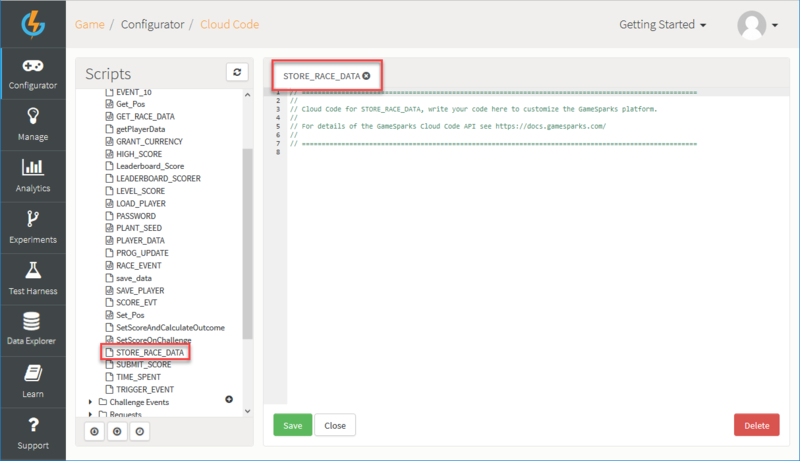 To do this, we'll create Event and Cloud Code scripts within the GameSparks Developer Portal and then test the configuration using the Test Harness. Important! If you're working on a new game that was created after the Game Data Service was launched in January 2018, you won't be able to create new Mongo Runtime collections and the Cloud Code used in the tutorial will not work. For the alternative tutorial for new games using the Game Data Service, see Sharing Data between Players Using Game Data Service. We will need to create an Event which we can use to post the ghost data into GameSparks when a player completes a race on a given track. This Event will have a Cloud Code script attached to it that stores the ghost data in the Mongo database. A second Event and Cloud Code script will be used to allow the game to query the ghost data collection for a given track and retrieve the player's ghost that represents the fastest time on this track. The tick field is the game's animation counter. The xPosition and yPosition are the coordinates of the player in the game world. The heading field represents the direction that the player is facing within the game world. Log in to the GameSparks Portal and navigate to Configurator > Events. Click to Add a new Event. 2. Click to Save and Close the new Event. In the Portal navigate to Configurator > Cloud Code > Scripts > Events. Copy and paste in the following Cloud Code script in to the Cloud Code editor and click Save. We will now use the Portal Test Harness and NoSQL Explorer to test the configuration and check the results. 2. Now click LogEvent under Requests and select the Store race data Event we created earlier and send the following LogEventRequest. Note that for simplicity in this example we are only sending an array of ghost data containing three items in this article but in reality this array would be much larger. If successful you'll get a LogEventResponse similar to this. 3. 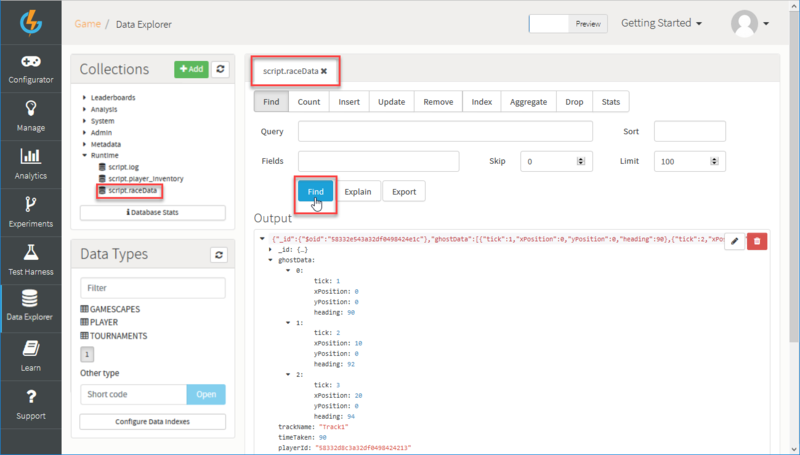 Now, navigate to the NoSQL Explorer and under Collections expand Runtime and select script.raceData. You'll see the document that was saved as a result of our Cloud Code script executing when the Event was received - this is returned into the Output panel. You can click on the document to expand, edit, or delete it. 5. Repeat the sending of the Store race data Event but change the data each time, especially the TIME field. This will result in several documents being stored in MongoDB for PlayerN1. 6. Now register a second player, PlayerN2, by sending a RegistrationRequest and repeat the sending of the Store race data Event. Change the data each time, especially the TIME field. This will result in several documents being stored in MongoDB for PlayerN2. Now we need to create an Event that allows the game to retrieve the fastest player's JSON ghost race data for a given track name. 1. Navigate to Configurator > Events. 2. Click to Add and a new Event. 4. Click to Save and Close the new Event. Next we create the Cloud Code script to retrieve the data from the MongoDB collection and return it in the LogEventResponse. 1. Navigate to Configurator > Cloud Code > Scripts > Events. 2. Select the GET_RACE_DATA Event we created in the previous section. 4. Click to Save the Cloud Code script on the Event. We'll now use the Test Harness to test the configuration and check the results. 1. Navigate to the Test Harness, under Scripts click Authentication, and select AuthenticationRequest. The response will look similar to this and should be the fastest timeTaken document from the collection for the given track.